The Velodrome in Olympic Park, closed since the end of the Rio 2016 Paralympics, will reopen on Friday, May 26th, for the 1st edition of the Rio Bike Fest. RIO DE JANEIRO, BRAZIL – Beginning on Friday, May 26th, The Velodrome in Olympic Park will once again be ground zero for cyclists and cycling enthusiasts alike as the facility will reopen for the opening of the first-ever Rio Bike Fest. 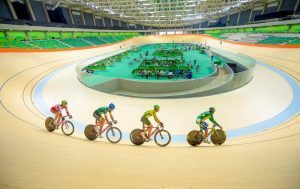 The Velodrome, in Barra’s Olympic Park, will once again host major cycling competitions as the facility reopens on May 26th for the first edition of the Rio Bike Fest, photo by Alex Ferro/Rio 2016. Closed since the Rio 2016 Paralympics ended on September 18th, the Velodrome in Olympic Park in Barra da Tijuca hosted track cycling events in both the Rio Olympic and Paralympic Games. It will reopen on May 26th for the start of Rio Bike Fest, until the event’s final day on Sunday, May 28th. The Rio Bike Fest will bring together top-level cycling, entertainment, and leisure under one roof. The three-day event will feature the 2017 Rio de Janeiro State Championship of Track Cycling competition, BMX Freestyle presentations, and Rio’s first-ever business expo related to cycling, with the biggest brands in the industry participating. Importantly, according to Rodrigo Babo, director of Federação de Ciclismo do Estado do Rio de Janeiro (Rio de Janeiro State Cycling Federation), the event will promote the Velodrome as a premier training facility for the world’s top cyclists. The Rio Bike Fest will culminate on Sunday with the Olympic Cycling Tour, where participants will cycle a twenty-kilometer route from Avenida das Américas along Ayrton Senna Avenue, towards Embaixador Abelardo Bueno Avenue finishing on Salvador Allende Avenue. Registration for the Olympic Cycling Tour costs R$20 and those interested can enroll at the event’s website. The Velodrome is currently being managed by the Autoridade de Governança do Legado Olímpico (Governing Body of the Olympic Legacy), a federal agency created earlier this year by Brazil President Michel Temer to implement the legacy plan of the Rio 2016 facilities, including the other Olympic Park venues such as Carioca Arenas 1 and 2 and the Olympic Tennis Center. In February 2017, the Olympic Tennis Center hosted a beach volleyball event which was the first sports event held at Olympic Park since the end of the Games. Admission to the Rio Bike Fest is free and the event will run from May 26th to May 28th.